William Blum, a Washington, D.C. writer, responded delightedly last Thursday on learning that Osama bin Laden had cited his book in an audiotape. 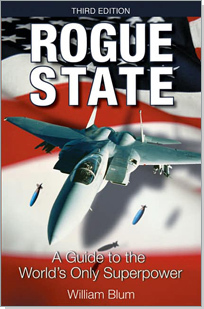 Blum called the mention of Rogue State: A Guide to the World's Only Superpower "almost as good as being an Oprah book," a reference to the popular American television host whose endorsement routinely makes a book a bestseller. Asked if he was queasy about bin Laden's urging listeners to read his book, Blum replied: "I'm not repulsed, and I'm not going to pretend I am." Quite the contrary, he said: "I'm glad. … It's good publicity for my book." And, indeed, it was: Thanks to bin Laden's promotion, Rogue State ascended from 205,763 to 26 on Amazon.com's ranking of most-ordered books. Blum explained his response by saying he found bin Laden no worse than the U.S. government: "I would not say that bin Laden has been any less moral than Washington has been." He even refused to distance himself from bin Laden's views: "If he shares with me a deep dislike for certain aspects of U.S. foreign policy, then I'm not going to spurn any endorsement of the book by him. I think it's good that he shares those views." Blum describes his life mission as "slowing down the American Empire, … injuring the beast." Not surprisingly, Noam Chomsky, Oliver Stone, Gore Vidal, and their ilk have lavished praise on his work. What attracted bin Laden to Blum? This passage (which actually comes from another of Blum's books, titled Freeing the World to Death: Essays on the American Empire): "If I were the [U.S.] president, I could stop terrorist attacks against the United States in a few days. Permanently. I would first apologize—very publicly and very sincerely—to all the widows and orphans, the impoverished and the tortured, and all the many millions of other victims of American imperialism." Until his sudden catapult into the public eye, Blum, 72, had lived the quiet life of a second-string America-hater. The child of Polish Jewish immigrants, he grew up in Brooklyn, studied accounting in college, and, as an anti-communist with aspirations to become a foreign service officer, he went to work at a computer-related position in the U.S. Department of State in the mid-1960s. The Vietnam War radicalized him and he resigned from State in 1967 to pursue a career of far-left advocacy and sabotage (he claims to have revealed the names and addresses of over two hundred CIA operatives). For nearly forty years, Blum has written op-eds after articles after books pursuing his hobbyhorse to prove the alleged evil of the U.S. government officials, whom he has compared to "chainsaw baby killers." He goes so far as to state the existence of an American-sponsored "holocaust" since 1945 that has caused the death of a few million people and condemned many more millions to "lives of misery and torture." David Horowitz, a foremost analyst of the left, sums up this line of thought in his excellent study, Unholy Alliance: Radical Islam and the American Left (Regnery): for Blum, "America is worse than Nazi Germany." Horowitz also notes that "there is no discernible difference" between Blum's view of the U.S. role in the Cold War and the crudest Communist caricature manufactured in the Kremlin. 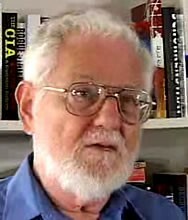 Although Blum was childishly delighted by his sudden celebrity and riches, his comrades on the far left reacted more warily to bin Laden's endorsement, aware how it reveals that, as Cliff Kincaid of Accuracy in Media puts it, "bin Laden is counting on a [leftist] fifth column in the U.S. to undermine the war on terrorism and hand him a victory on the battlefield." Such exposure so worries some on the far left that they have gone so far as to portray the bin Laden audiotape to be "an obvious fake" concocted by neo-conservatives in the U.S. government. But elaborate conspiracy theories cannot undo the fact that the Islamist-leftist alliance, burgeoning for years, has now reached the point that the far left constitutes Al-Qaeda's new mujahideen. After having failed to mount a massive terrorist operation in the United States in over four years, bin Laden's early but very public Valentine to the far left suggests that he sees it as a critical ally. And he is entirely correct to do so. Sep. 17, 2009 update: Gabriel Schoenfeld updates this analysis at "Osama's American Yes-Men," reporting on the mutual admiration society that exists between bin Laden, John Mearsheimer and Stephen Walt, Jimmy Carter, and Michael Scheuer.